The DAF TROPCO (Trekker Oplegger Combination) heavy equipment transporter was developed to meet requirements of the Dutch Ministry of Defense. 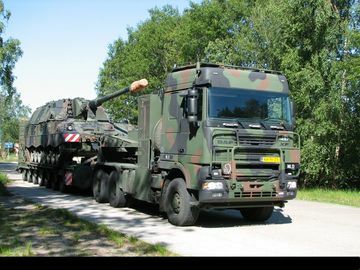 It is a tractor-trailer combination, used to transport Leopard 2 main battle tanks and PzH-2000 self-propelled howitzers. The TROPCO is based on the DAF XF95 commercial tractor truck, but has a different drivetrain and other modifications to meet specific military requirements. The Dutch Ministry of Defense wanted a militarized version of commercial tractor truck in order to simplify support. A total of 112 tractor trucks and 102 semi-trailers were ordered. First prototypes were ready in 2003 and deliveries commenced in 2005.